Be careful when examining family Bible records concerning births, marriages, deaths and other events. These entries may not be primary records, but instead are secondary sources and require additional proof of their veracity. They may have been entered or transcribed later, thereby making their accuracy questionable. Check the copyright or publication date of the Bible. If dates on family entries precede the Bible's date, they are secondary sources. If all the entries appear to be written in the same hand, with the same pen or pencil, and at the same time, be skeptical -- they were probably transcribed. Family Record page from George's grandmother's Bible. 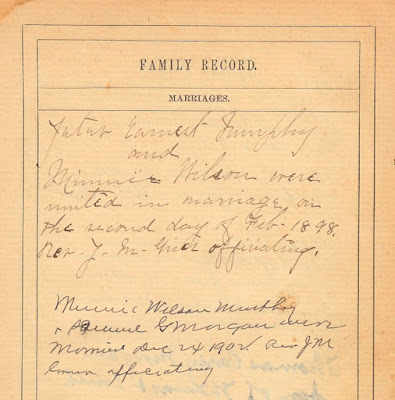 Minnie Wilson was married on 2 February 1898 to Jeter Earnest Murphy. He died of typhoid fever on 9 July 1898. 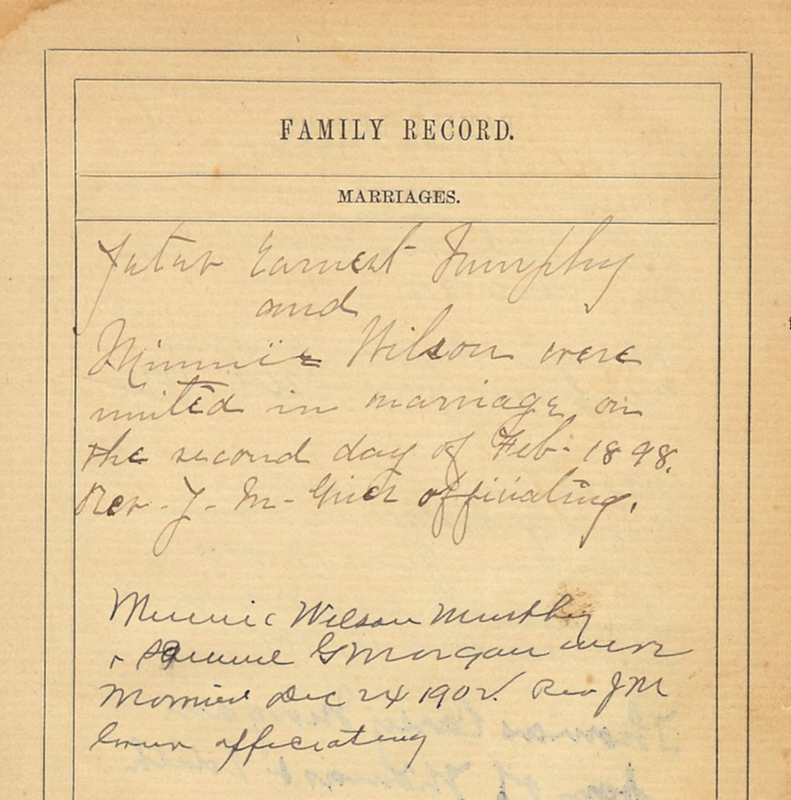 On 24 December 1902, Minnie Wilson Murphy remarried, this time to Samuel G. Morgan, George's grandfather. Both entries were made using fountain pens, apparently at different times because the ink differs. The publication date of the Bible is 1882, which lends some credence that the entries may have been recorded at the times of the marriages. Copyright © Aha! Seminars, Inc.